© Dmitry Dukhanin/Kommersant/Sipa USA, via Associated Press Images A cache of hacked emails has shed light on the Russian security connections of the oligarch Konstantin Nikolaev. An oligarch who helped finance a Russian gun rights activist accused of infiltrating American conservative circles has been a discreet source of funds for business ventures useful to the Russian military and security services, according to documents and interviews. The oligarch, Konstantin Nikolaev, emerged in July as the enigmatic backer of Maria Butina, the activist charged with conspiring to use the National Rifle Association to cultivate Republicans in the United States. Mr. Nikolaev has acknowledged underwriting her gun rights advocacy in the past, but denies any involvement in a Russian influence operation and says his only dealings with his government are limited to routine business needs. Though his public persona is that of a billionaire in the prosaic industries of ports and railways, a cache of 9,000 hacked emails — from the account of Alexey Beseda, whose father is a general in Russia’s Federal Security Service, the successor to the K.G.B. — reveals another side to his business activities. Mr. Nikolaev has been an investor in a gun company run by his wife that developed a sniper rifle used by the Russian National Guard, which reports directly to President Vladimir V. Putin. He is also a major investor in a satellite imagery firm that has a license from the Federal Security Service, or F.S.B., to handle classified information. Less well known is Mr. Nikolaev’s role providing money for a Kremlin-backed project to develop night-vision technology that the military sought after Western sanctions made it difficult to obtain. Mr. Nikolaev’s role was obscured by complex transactions involving offshore companies and Mr. Beseda, the documents show. “The project closes one of the main strategic technological gaps in the defense capability and technological independence of the Russian Federation,” Dmitry Rogozin, then deputy prime minister, said in a 2013 letter. “More to the point, Mr. Nikolaev is not connected to Russia’s security services,” said the spokesman, Jeffrey H. Birnbaum. 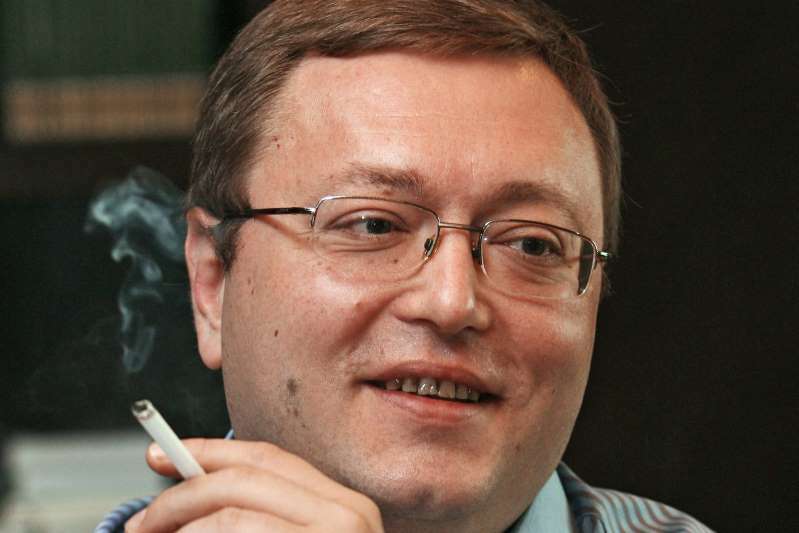 Mr. Nikolaev, 47, maintains a low profile in the Russian oligarchy, but he was thrown into the spotlight when his name surfaced in connection with the Butina case. The F.B.I. also said that Ms. Butina’s emails and text messages referred to an oligarch with “deep ties to the Russian presidential administration” who served as her “funder.” The oligarch was not named in court documents, but the description matches Mr. Nikolaev, and several people familiar with the case have confirmed his role. Worth slightly more than $1 billion, Mr. Nikolaev, together with two partners, owns about a third of Globaltrans, one of Russia’s largest rail car operators, and the trio recently sold a major stake in a port business. He also sits on the board of American Ethane, a Houston-based energy company, and has invested in business ventures with Igor Rotenberg, the son of Arkady Rotenberg, a close childhood friend of Mr. Putin’s. Mr. Nikolaev once served on a government-sponsored council for public-private partnerships in the military-industrial sector, along with influential oligarchs like Oleg V. Deripaska, a longtime associate of the Trump campaign’s convicted former chairman, Paul J. Manafort. And his business entanglements stretch into areas that share a theme of military and security applications, which generally require trusted relations with the authorities. “Nikolaev’s holdings in Russia’s critical infrastructure and weapons programs are sufficient to support the theory that he is an oligarch in good standing with the Russian government and, clearly, with the F.S.B. through his business dealings with Beseda,” said Jeffrey Carr, an American cybersecurity analyst who obtained Mr. Beseda’s emails from pro-Ukrainian hackers several years ago. Mr. Carr shared the emails with The Intercept in 2015, and more recently with The New York Times. Mr. Beseda was a hacking target because of his connection to the F.S.B., where his father, Sergey Beseda, was involved in the intervention in Ukraine and is under American sanctions. In a 2015 report, Mr. Carr’s consulting firm at the time, Taia Global, concluded that the younger Mr. Beseda was also “almost certainly an F.S.B. officer,” as was another person involved in the night-vision project. Mr. Beseda did not respond to requests for comment. Previously, he has not denied the authenticity of the emails. The business plan described Mr. Nikolaev as a private “co-investor” who would put up roughly $12 million. Other funds would come from a government research institute and a large state-owned development bank. The plan did not explain that Mr. Nikolaev’s investment would filter through offshore companies registered in the British Virgin Islands, Cyprus and Seychelles. Those firms entered into transactions with other offshore shells involving Mr. Beseda, who took over Mr. Nikolaev’s stake by 2016, according to the Russian newspaper Novaya Gazeta. The emails also shed light on another of Mr. Nikolaev’s ventures, one that intersected with Ms. Butina’s efforts to cultivate the N.R.A. In December 2015, she accompanied an N.R.A. delegation that included its former president, David Keene, on a visit to Orsis, a Russian gun maker that sells sniper rifles to the Russian National Guard. At various times, Promtechnologies executives have included Alexander Beseda, another son of the F.S.B. general, and Alexey Rogozin, the son of the former deputy prime minister. The elder Mr. Rogozin, who is subject to Western sanctions, also met with the N.R.A. group during its trip to Moscow with Ms. Butina. Mr. Nikolaev’s spokesman said that the billionaire’s involvement in the company ended in 2014, and that it was “a free-standing commercial business unconnected to the Russian government.” He added that Alexander Beseda and Alexey Rogozin worked there “only briefly” and left in 2012. The Beseda emails also contained documents pertaining to ScanEx, a Russian satellite-monitoring service in which Mr. Nikolaev became a major investor in 2014, along with Mr. Rotenberg, the son of Mr. Putin’s friend. Mr. Beseda appeared to be advising ScanEx on potential contracts with the Russian government, including the F.S.B. and the G.R.U., a Russian intelligence agency. “It is not an indication of a tie to Russia’s security services,” he said.